Shaurya divas was celebrated under the aegis of district Administration and Department of soldier Welfare and Rehabilitation in the district. 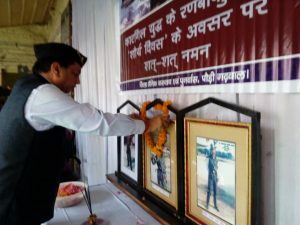 DM Pauri along with ex-servicemen and common citizenry offered floral tributes on the portraits of the Karil Martys on the occasion. 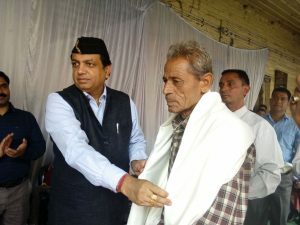 DM presented shawls to the dependents of the Martyred soldiers. The students from GGIC presented several patriotic songs and cultural items on the occasion. DM presented citation and award to the winners of essay competition on the occasion.The students from Vidya Mandir, GIC, GGIC, MIC,DAV along with NCC cadets took out a march past from agency chowk to Mall road and passing through Dhara road reached the collectorate premises on the occasion. DM Sushil Kumar remembered the Kargil Martyrs for their sacrifice given to the nation. He inaugurated the program by hoisting the flag and observing two minutes silence in the memory of the Kargil martyrs. He said that the soldiers have sacrificed their lives to protect the borders of our country and thus keeping us safe and this tradition is intact till today. He called on the youth join voluntarily to serve the country. He said that the state of Uttarakhand was fortunate that one persons from the family was serving the nation by joining the armed forces. He commended the cultural and patriotic programs presented by the GGIC students on the occasion. DM presented shawl to the mother of Vir chakra awardee Martyr Kuldeep Singh from Bhintai Village, Nayak Retd Trilok Singh Rawat who was injured in the war and Nayak (Retd) Dalveer Singh from Simlath as a mark of honour on the occasion. Gargi Dhyani from Vidya Mandir stood first, Himanshi form MIC stood second and Kuldeep Negi form GIC stood third in the essay competition in senior division while Bhaskar from GIC, Kumkum from GGIC and Komal from DAV stood first, second and third respectively in junior division. BE student Rohit Bisht, B.Tech student Rahul Chauhan, B tech student Priyanka Gusain, B.Tech student Amit Negi and B. 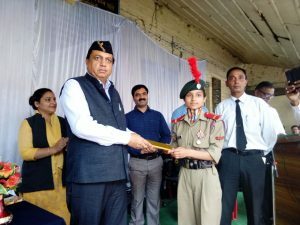 Tech student Raksha Bisht were presented the scholarship given to the dependents of the soldiers on the occasion. Major Karan Singh (), Ex-serviceman Satya prasad Dhasmana shed light on the Kargil war through a short film and phot exhibition. They said that the soldiers showed exemplary courage in this war and the brave form Uttarakhand sacrificed their lives in the interest of the country. They said that out of 75 soldiers martyred in the Kargil war 17 were from Pauri district. Chief development officer Dipti Singh, Additional District magistrate Ramji Sharan Sharma, Col. Paras Basnet, C. (retd) Anand Kumar Thapliyal and others were present on the occasion. District Magistrate, offering a tribute to the martyrs of Kargil. District Magistrate honoring the retired Soldier of Kargil war. 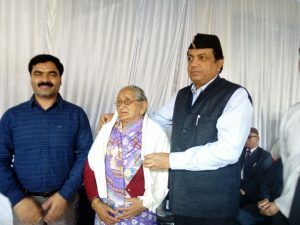 District Magistrate Shri Sushil Kumar and Additional District Magistrate, Shri Ramji Sharan Sharma honoring Veer Chakra winner Shaheed Kuldeep Singh’s mother Kamla Devi with a shawl. With District Magistrate,Smt.Dipti Singh Chief Development Officer,Shri Ramji Sharan Sharma Additional District Magistrate and Maj Karan Singh District Sainik Welfare Officer Pauri. Rewarding the NCC cadet who received the top position in essay competition.